There are three main groups of pear trees (Pyrus spp. ), according to Texas A&M University. European pears have soft, juicy flesh. Asian pears are crispier and are often called "apple pears" for their resemblance to apples. Oriental pears are hybrids. Some varieties of these pear trees produce fruit, while others are only ornamental. Which of these you consider to be the best depends in large part on your reason for choosing to grow a pear tree. Still, there are some that are considered to be hardier and easier to grow than others. Pyrus "Summercrisp" is a very strong pear tree cultivar. This tree's heritage is not known, although it tends to resemble Asian pear trees over European pears. 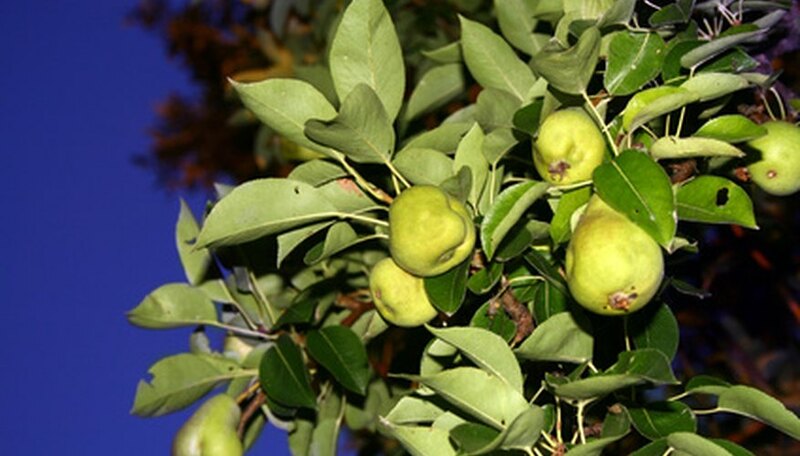 This pear tree is an excellent choice for home gardeners who live in cold climates, as it is very cold-hardy. Summercrisps can tolerate temperatures to 50 degrees below zero Fahrenheit, according to the University of Minnesota. Summercrisp pear trees are also one of the earliest flowering pear trees, making them an attractive choice in landscapes that are barren of early spring color. The trees are on the smaller side, averaging only 18 feet tall, which is another reason why they are good in home gardens. Finally, Summercrisp pear trees are free of most insect pests and diseases, including the fatal fire blight disease. Summercrisp pears should be eaten right off the tree or refrigerated immediately. They should and not allowed to ripen off the tree or become soft or they might develop an unpleasant odor. "Warren" is the best Oriental hybrid in terms of fruit quality and resistance to fire blight, according to Texas A&M University. The pears are very smooth, not gritty, and are excellent baked, canned or eaten raw. The fruit size is small or medium, with a faint red tinge. The pears are harvested in August. "Beierschmidt" is a very hardy European pear variety. The pears are large, with long necks and golden yellow skin. The skin is thin and the flesh is very tender. This is one of the best pear trees if you want sweet, juicy, melting pears to eat raw. The pears are top quality fruit and are harvested in September. "Luscious" pear trees are also excellent for cold climates. This hardy, fire-blight-resistant European pear can tolerate northern climates and produces very large, very sweet pears. The pears, which are harvested in mid-September, are not ripe until they have been stored for a week to 10 days. They can last up to two weeks and still be good to eat, making this one of the best pear trees for home gardeners who want to store or gift their pears.